Tim Howes, of NGK Spark Plugs, explains why the spark plug is the pacemaker at the heart of every petrol engine. Precise control of ignition has always been a critical part in the process of extracting the energy from fuel, but the more we demand in terms of power, torque, starting performance, economy and reduction in emissions, the greater this requirement becomes. All components within the ignition circuit are under a great deal of stress and have to be of significantly higher performance than in years gone by, but they all operate in relatively moderate conditions when compared to the spark plug. After all these years of technological development, it’s still the intense heat energy released by the spark as it jumps the electrode gap that initiates the combustion process. So, what is actually happening at the electrodes? Fundamentally, just before TDC on every firing stroke, the ignition coil is instructed to apply a high voltage between an anode and a cathode – the plug’s electrodes. As there is a significant gap, usually between 0.8 and 1.0mm between these two, initially current cannot flow – the circuit is ‘open’. However, because the potential available voltage from the coil is so high (tens of thousands of volts) the structure of the gasses between the electrode surfaces begins to change. Without writing pages on ultraviolet radiation generating photoelectrons which collide and, by impact particle breaking, eventually generate a higher electron number… no, I’ll stop there and say that the air/fuel gaseous mixture becomes ionised, allowing current to flow between the two. This is the spark! Once the spark arrives, the heat it produces starts the air/fuel mixture in the adjacent area to burn, which then spreads in a completely controlled manner throughout the combustion chamber. This all happens more than eight times a second for each spark plug, whilst the engine of an average family car is idling. It becomes mind boggling when one thinks of what is happening at the firing end of the plug in an F1 car, where engine speeds are approaching 20,000 rev/min. spark plugs. We need to have both good conductors and particularly good insulators of electricity to contain well in excess of 30,000V. We also need materials that have high mechanical strength and a great ability to withstand extremes of temperature. These changes in temperature occur rapidly, due to the large amount of heat generated by combustion being immediately cooled by the incoming fresh charge of air and fuel. Under extreme conditions, the force of shock from combustion vibrations can reach 50G, or 50 times the force of gravity. The base material of the insulator – the white part – is aluminium oxide, which we obtain from bauxite, one of the most common compounds found on earth. This high purity aluminium oxide powder is doped with other material to further enhance its mechanical, thermal and dielectric properties. After forming, it is sintered and glazed to produce the familiar hard smooth form of the plug. The resultant insulator is so good for its intended purpose that it has not changed significantly for many years. The main electrode is formed from copper and a nickel alloy, offering good electrical and heat conduction with high wear resistance. To increase wear resistance further, especially when very fine electrodes are required, small chips of semi-precious metals such as platinum or iridium alloys are welded to the nickel alloy. Iridium, for example, is extremely hard, has a particularly high melting point and is probably the most corrosion-resistant metal available. This allows diameters of 0.4mm to be employed at the centre electrode. This offers the advantages of improved ignition performance and increased service life. 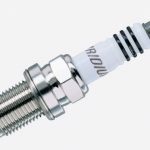 The electrical noise suppression resistor is located within the insulator ‘in series’ with the main electrode and is formed from a mixture of conductive carbon and insulating glass powder. Varying the proportions of the two materials allows different target resistance values (as required by the OEMs) to be achieved easily without fear of degradation during the service life of the plug. The normal target value is 5 kilo ohms. The metal shell that houses the insulator will have one or more electrodes welded to it. Depending on application, these may be nickel alloy or inconel. Inconel is often employed where special resistance to high temperatures is required and, as a further refinement, a layered copper design can be used. So even the small J-shaped ground electrode that you pay little or no attention to when handling a plug has a lot of thought put into its design. The sealing washer that gets compressed upon installation is usually of folded mild steel construction, but can be stainless steel, which guards against vibration, or even solid copper to promote good heat transfer. So what goes wrong when experiencing a perceived spark plug problem? Well I have heard that plugs cause problems as varied as misfires to flat tyres… and I am not joking. It must be remembered that if the plug is the correct one specified for the application, is within its recommended service life and it has been installed correctly, it is highly unlikely that the plug is the root cause of any problem. The plug produces no heat or deposits; it’s the combustion process that does that and the poor old plug has to suffer all that is thrown at it. When cars get older, all the equipment on board starts to tire. For instance weak coils often wreak havoc and renewing the plugs can temporarily take some of the load off these components, leading to a misdiagnosis of the true fault. So, when you’re installing these little marvels of technology, spare them a little more thought. 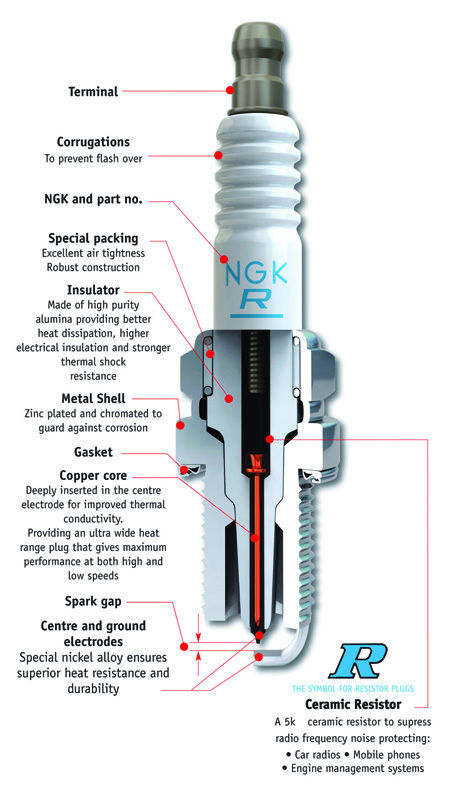 For more information about NGK Spark Plugs, and its products and services, click here.